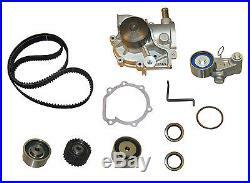 Engine Timing Belt Kit-with Water Pump and Seals CRP fits 00-05 Subaru Legacy. 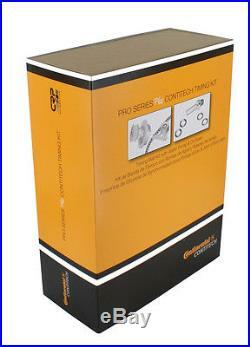 Marketing Description - 2000 : CRP ContiTech OE Quality Pro Series Plus Kit PP307LK1 includes a timing belt (ContiTech), water pump w/ metal impeller (Nitoma), two idler pulleys (GMB & Koyo), idler gear pulley (GMB), hydraulic tensioner (NTN), two camshaft seals (OE), and installation instructions. This kit includes the water pump housing that is often a victim of corrosion on these vehicles. By choosing this kit you don't have to worry about unwanted surprises popping up when changing the water pump. These kits make sourcing parts easy. Product Description - Long - 80 : CRP ContiTech OE Quality Pro Series Plus Timing Kit. 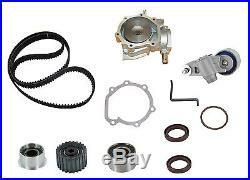 AAIA Part Type Description : Engine Timing Belt Kit with Water Pump. Belt Length (Inches) : 70.24. Belt Length (Metric) : 1784.00. Belt Width (Inches) : 1.06. Belt Width (Metric) : 27.00. Qty of Camshaft Seals in Kit : 2. Qty of Idlers in Kit : 4. Timing Belt/Kit Change Interval (Miles) : 100000. See Item Specifics section for additional specifications about this part. To confirm that this part fits your vehicle, enter your vehicle's Year, Make, Model, Trim and Engine in the Compatibility Table. Also review the notes section in the compatibility chart for additional specifications about this part. The engine types may include 2.5L 2458CC H4 GAS SOHC Naturally Aspirated. This part fits vehicles made in the following years 2000, 2001, 2002, 2003, 2004, 2005, 2006. This item may interchange to the following part numbers from other brands. Brands: SKF (CHICAGO RAWHIDE) Part Numbers: TBK307WP. OUR GOALS: To supply the best quality auto parts To deliver on time as described with 100% satisfaction To use the best business practices in a professional manner To operate a clean and safe workplace that protects the environment To treat our customers, suppliers, and employees with trust and respect To strive for a level of product quality and service that surpasses expectations. Once the product is received, it will be inspected to ensure the original packaging has not been damaged, no parts or hardware are missing, all installation instructions are present, the part is not damaged or disassembled, and no evidence is present of the product being installed and removed, then a credit will be issued. , Special order products, Promotional or discontinued products. Portions of the part information on this page have been provided by WHI Solutions, Inc. The item "Engine Timing Belt Kit-with Water Pump and Seals CRP fits 00-05 Subaru Legacy" is in sale since Thursday, April 20, 2017. This item is in the category "Automotive\Parts & Accessories\Car & Truck Parts\Engines & Components\Timing Components". The seller is "canadaautosupply" and is located in Delta, British Columbia.